James Richard Laurinaitis (born December 3, 1986) is an American football linebacker who last played for the New Orleans Saints of the National Football League (NFL). He played college football at Ohio State, where he was a three-time consensus All-American and won numerous awards. He was drafted by the St. Louis Rams in the second round of the 2009 NFL Draft. Laurinaitis was born in Wayzata, Minnesota. He was raised in a family of athletes – his father Joe and two uncles (John and Marcus) were professional wrestlers. He attended Wayzata High School, and played high school football and hockey. He was touted as a potential second or third-round National Hockey League (NHL) draft pick, but teams didn't draft him because it was thought that he was more likely to pursue a football career. While he was a successful hockey player, having been named a team captain as a senior, football was arguably his best sport. He was named Defensive Mr. Football in Minnesota in 2004. That season, he helped lead his high school football team to the state championship game in Class 5A with 193 tackles, including 28 for loss and five sacks. Laurinaitis chases Brandon Minor during the 2008 Michigan–Ohio State rivalry game. Laurinaitis attended Ohio State University, where he played for coach Jim Tressel's Ohio State Buckeyes football team from 2005 to 2008. As a true freshman in 2005, he played in all 12 games eventually reaching No. 2 on the depth chart at strong-side linebacker behind Bobby Carpenter. After Carpenter broke a leg on the first play from scrimmage in their rivalry game against Michigan, Laurinaitis played the rest of that game, and also started in their Fiesta Bowl victory over Notre Dame. At the end of the 2006 regular season, Laurinaitis led the team in tackles (115) and interceptions (5), and also had 8.5 tackles for loss and 4.0 sacks. In 2006 Laurinaitis won the Nagurski Award as the nation's best defensive player, and was also named a finalist for the Butkus and Bednarik awards. He was a first-team All-Big Ten selection, and was recognized as a consensus first-team All-American. Laurinaitis won the Butkus Award for most outstanding college linebacker in 2007. He was also recognized as a unanimous first-team All-American in 2007, having been named to the first teams of multiple selectors including the Associated Press (AP), the American Football Coaches Association (AFCA), FWAA, Sporting News, the Walter Camp Foundation, and Rivals.com. He was honored as the Big Ten Defensive Player of the Year. In 2008 he was named one of four finalists for the 2008 Rotary Lombardi Award (only Big Ten player in consideration for that award) and the winner of the Lott Trophy for The Defensive IMPACT Player of the Year and the recipient of the Lowe's Senior CLASS Award. He was recognized as a consensus first-team All-American for the third consecutive year. He was also a finalist for the Chuck Bednarik Award, presented to the nation's top defender by the Maxwell Club of Philadelphia and one of five defensive players among fifteen finalists for the Walter Camp Player of the Year award. He started all thirteen games, becoming the fourth player in school history to lead the team in tackles three times in a career, as he ranked second in the Big Ten and 14th nationally with an average of 10.0 tackles per game. He recorded a career-high 130 tackles (52 solos) that included four sacks, seven stops for losses and one quarterback pressure, caused a fumble, deflected four passes and picked off two others. Laurinaitis is the only player to ever win two Big Ten Defensive Player of the Year awards (in both coaches and media). Laurinaitis playing in Denver on November 28, 2010. Laurinaitis was drafted in the 2nd round 35th overall by the St. Louis Rams. On July 29, 2009, he signed a four-year, $5.1 million contract. The deal contained $3.3 million guaranteed. Laurinaitis earned the starting middle linebacker position at the beginning of the season and led the Rams in tackles and was voted the Carroll Rosenbloom Memorial Award, which goes to the Rams rookie of the year. He was also named the NFL All-Rookie team by Sporting News. In 2011, his third NFL season, Laurinaitis made a career-high 142 tackles. For the 2012 season, he was voted one of the Rams team captains. In September 2015, Laurinaitis made his 916th tackle in his career, moving him into first-place on the franchise's all-time list. He was released by the Rams on February 19, 2016. On March 16, 2016, Laurinaitis signed with the New Orleans Saints. He was placed on injured reserve on November 5, 2016 with a quad injury. On November 17, 2016, Laurinaitis was waived by the Saints from the injured reserve. Laurinaitis is one of two children born to Joseph and Julie Laurinaitis. He has Lithuanian roots on his father's side. Laurinaitis has a half-brother, Joseph, Jr., from his father's first marriage, who is a veteran of the Iraq War and training to become a police officer. His younger sister, Jessica, played on her high school hockey team and graduated from high school in 2008. Laurinaitis' father Joe is a semi-retired World Wrestling Entertainment (WWE) professional wrestler better known by his ring name Road Warrior Animal, one half of legendary wrestling tag-team The Road Warriors, while his uncles Marcus and John Laurinaitis are also former professional wrestlers. Through his uncle John's marriage he is also related to professional wrestlers The Bella Twins and Daniel Bryan. On March 23, 2013, Laurinaitis married Shelly Williams whom he met while attending Ohio State University. The couple welcomed their first child, a daughter born on September 15, 2014. Laurinaitis is an evangelical Christian. Laurinaitis has spoken about his faith saying, "To me, there’s nothing that trumps my faith in Christ—not even an NFL career. Everything I have on this earth is borrowed. All that really matters is eternity. God has blessed me with a platform and with an opportunity to do something that I love to do. Out of my gratefulness, I give all that I have as if He’s the only One watching. ↑ "Overall Defensive Statistics". Ohio State Buckeyes Football. 2006-11-18. Retrieved 2007-01-18. ↑ "James Laurinaitis Biography". The Ohio State Buckeyes Official Athletics Site. ↑ "James Laurinaitis". NFL Draft Scout.com. March 25, 2009. Retrieved April 16, 2009. ↑ Nawrocki, Nolan (April 21, 2009). "The Way We Hear It — draft edition". Pro Football Weekly website. Retrieved April 25, 2009. ↑ Sessler, Marc (February 19, 2016). "Rams cut Chris Long, James Laurinaitis, Jared Cook". NFL.com. Retrieved February 19, 2016. ↑ "Saints agree to terms with LB James Laurinaitis and S Jamarca Sanford". New Orleans Saints. March 17, 2016. Retrieved March 18, 2016. ↑ "Saints put linebacker James Laurinaitis on injured reserve, ending his season". NOLA.com. November 5, 2016. Retrieved November 5, 2016. ↑ Dabe, Christopher (November 17, 2016). "Saints waive linebacker James Laurinaitis from injured reserve". NOLA.com. Retrieved November 29, 2016. ↑ Ron Clements. "'Football junkie' is what's right in pro sports". Bleacher Report. ↑ "James Laurinaitis & Shelly Williams Wedding". Alivemag.com. 2013-11-01. ↑ "James Laurinaitis & Shelly Williams Wedding". mmjevents.com. ↑ "James Laurinaitis Welcomes Daughter - Rams on high alert for Cowboys' Murray". washingtontimes.com. 2014-09-19. ↑ "James Laurinaitis Welcomes Daughter". Twitter.com. 2014-09-15. ↑ "James Laurinaitis, St. Louis Rams". 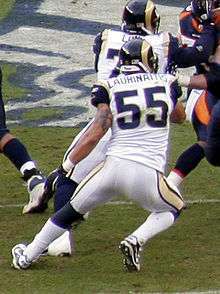 Wikimedia Commons has media related to James Laurinaitis.